Howard, Howard, Howard. Can I call you Howie? HoLo? No? Ok, Howard it will be. My name is Matt Paige, Seattle Side Up Baseball Editor and member of the Seattle fan base who have watched and lamented the Mariners during most of your tenure as CEO of the team. We’ve watched with pained expressions as you made media gaffe after media gaffe. Ok, so working with the press isn’t your forte; that’s no crime. I’ve made my peace with you remaining as CEO of the team. As long as Nintendo continues to remain the absent owner they prefer to be, you will be the CEO. That is how it will remain until your retirement in a few years. But let’s be honest here for a minute: your tenure as CEO of the M’s doesn’t have the most sparkling of records. You’ve overseen the team since the mid 90s, and you’ve been credited with chasing away a HOF General Manager, and at least 2 Managers. During the 20 years of your management, the team has made the playoffs 4 times and had a losing record 10 of those years (soon to be 11 most likely). You hired one of the least competent GMs in recent history in Bill Bavasi, and attempted to correct the wrong with the hiring of Jack Zduriencik. That brings me to my point for this letter. It’s time to move on from Jack Z, and end your career on a high note. The opportunity presents itself right now to make a literal game-changing move. Jack Z has misrepresented himself, overseen the signing of albatross contracts, and refuses to learn from his mistakes. He’s fundamentally misjudged the type of roster he needs at the major league level to succeed and it’s time for him to move on. Everyone in baseball is aware of this, and a part of you must know it too. But who would you move on to? The first thing you need to do is assess the needs of the organization. Good minors scouting base, as we tend to have a moderately-ranked farm system. The system continues to produce pitchers for us on the cheap, but struggles to adequately coach up the hitting. So that’s something that needs to be addressed. Major league level scouting needs work. There’s a lack of focus on defense in a cavernous outfield. Finally, you need someone who can construct a roster to fit the strengths and weaknesses of Safeco Field, as you’ll be playing at least 80 games there. To that effect, I’ve come up with 3 potential candidates that deserve real consideration. These 3 deserve to be given the red carpet treatment and a serious salary as they all possess the ability to take this team to the next level. These men have the experience we need, and the knowledge to take the Mariners into the future. You may not agree with them on decisions they make, but they’ve earned the benefit of the doubt in the industry’s eyes. Check the wishlist of any other team that needs a GM and these 3 will be near the top, and for good reason. So Howard, please make the right call and pull the trigger soon. The good ship Mariner is not righting itself this season, and the fall guy should NOT be the hitting coach. The problem is more systemic than that; it’s the Architect. 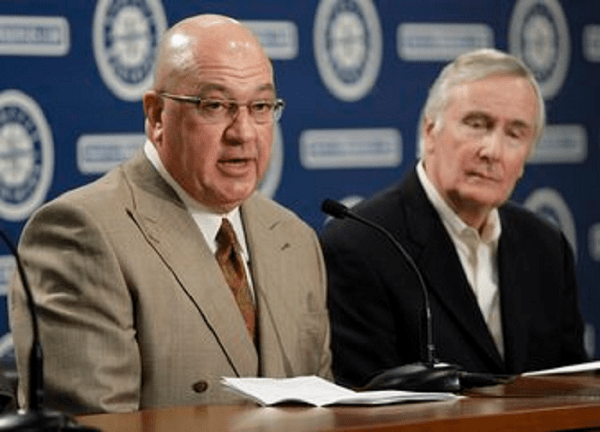 Save your legacy and bring in a forward thinker who can finally bring the Mariners into the 21st century. I’ll take the guy from St. Louis then Oakland. But forget the dude from the Cubs….They’re just as bad. Great article. I have been bashing GM Jack for a long time. You made some good points and left out some pretty big ones. The contract with ROOT sports and the promising of Cano. There were no real negotiations between either. ROOT said get a big free agent. Jack promised Cano. Jack gave Cano (Jay-Z) exactly what they asked for, and then ROOT gave Seattle about 2 billion for 16 years tv rights. Both of those deals were either over or undersold. My open letter to the Mariners.